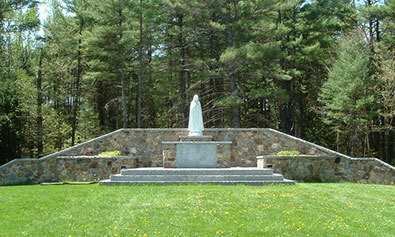 On May 13th we will celebrate the 100th anniversary of Our Lady of Fatima. Our Blessed Mother’s message, so many years ago, is just as important today as it was when she first appeared to Lucia, Jacinta and Francisco. She told the three children to make acts of sacrifice and to pray for peace in our world. Every summer at Camp Fatima & Camp Bernadette we continue to live this message daily with all our staff and campers. We come together every evening for shrine and we celebrate Mass every Sunday as well as on our B/F Days with both camps together. Campers are given several opportunities throughout the session to grow in their faith by participating in the Rosary club, Adoration of the Blessed Sacrament, Senior Retreats and receiving the Sacrament of Confession. Additionally, a program was started a few years ago at Fatima, and will be expanded to Bernadette, where campers could forego their canteen snack allowing whatever money was saved that session to be donated to a worthy charity chosen by the CIT’s. Each session approximately $150.00 has been donated to charities like Wounded Warrior Project, Care Net Pregnancy Center, local food banks and homeless shelters. We also give campers the chance to increase their faith as they play and live in an intimate group of 10-12 campers making lifelong friends and sharing their gifts with one another. Whether it is supporting a friend who is homesick, being good stewards of all of our resources, or giving up their canteen snack for the day, the message of Our Lady of Fatima is alive and present in every child and staff member. To help commemorate the 100th anniversary, we will be having a very special B/F Day during our 3rd session at camp. Our local NH parishes will be able to invite their youth ministry programs to help celebrate the day. Throughout the day, we will have opportunities for campers to participate in the rosary, have several priests available for Confessions, and learn more about the message of Our Lady of Fatima. Afterward, we will come together for praise and worship music, Mass and camp cookout. There will also be our traditional B/F day filled with activities, bounce houses, a dunking booth and much more! As the school year is winding down, I pray for the continued success of all of our campers and staff as they take their end of the year finals. I ask that you please keep the camps in your prayers as we continue preparing for another fun and faith-filled summer camping season. Our Lady of Fatima, Pray for us! Our Lady of Lourdes, Pray for us!